In the final moments of her life, the enigmatic Conlan drags Eleanor from her world and into his. 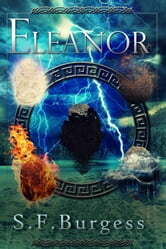 Mydren – a vast, majestic land where myths have substance, magic is terrifyingly real and Eleanor is marked for death. Reborn as an Avatar, the living incarnation of an ancient magic, Eleanor must think fast and act faster if she wishes to survive. This new life comes with a price; Conlan has a vital and dangerous mission to undertake. Eleanor must learn to control her newfound abilities and cope with a host of dangers both mystical and natural, while helping her fellow Avatars to master their own talents, so they can get the connection between them working. Can she make ‘The Five’ a force to be reckoned with? Will their deadly enemies destroy them? Can Eleanor overcome her own fears and find the courage she needs to reach Conlan and release him from his dark secrets?